For the average person looking for cheap airfares in the United States, Google Flights is probably the best tool to search for flights. Google Flights offers a combination of powerful search features and ease of use that make it my go-to site for searching for airfares. Here are the basics. Note: I searched for these flights on October 6, 2014, so these specific flights may no longer be available at these prices. What you see in the example is actually the first city pair I tried searching for. Of course, your mileage may vary. The simplest thing that you can do is to go to Google Flights an enter your origin and destination like any airline website. 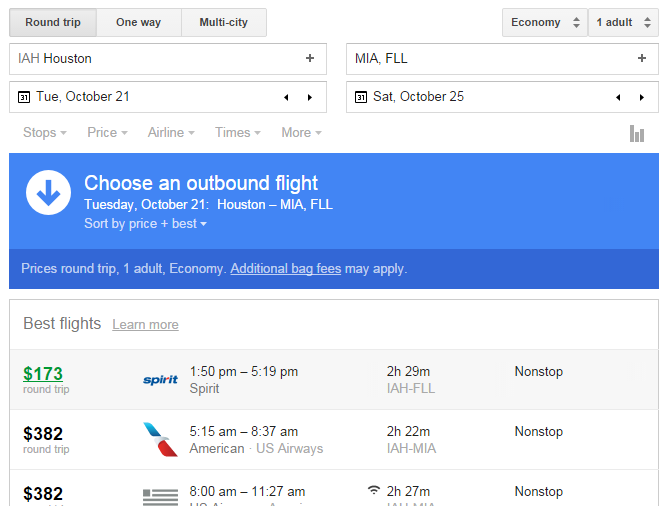 Google flights will search for your flights and display some airfares. In the search box, next to either the origin or destination, click on the + icon. This will pull up a list of alternate airports near your selected airport. If you’re able to fly out of (or into) one of these alternate airports, you can tick the box by that airport. Several airports near your chosen airport may be displayed, with flight prices that match the rest of your search. In our example, it looks like flying to Fort Lauderdale can save us $100. 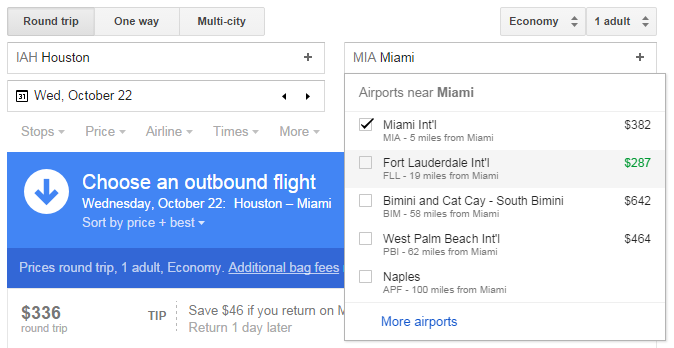 If we tick the box by Fort Lauderdale, airfares between Houston and Fort Lauderdale will be displayed, in addition to airfares between Houston and Miami. 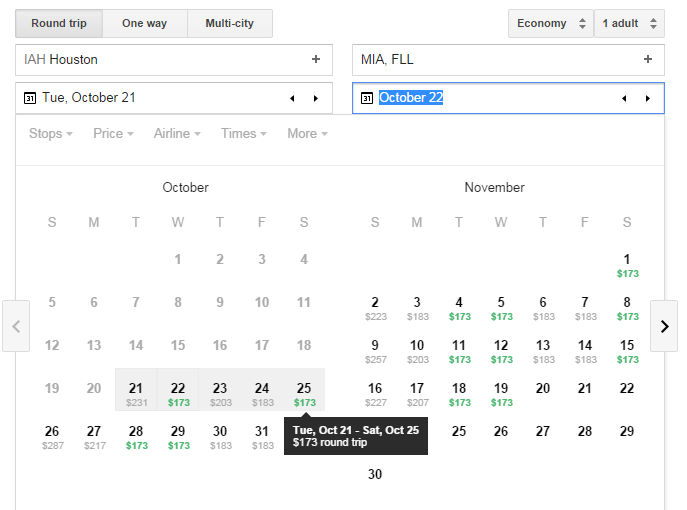 …the calendar changes and shows us airfares for different return dates, based on an outbound travel date of October 21st. 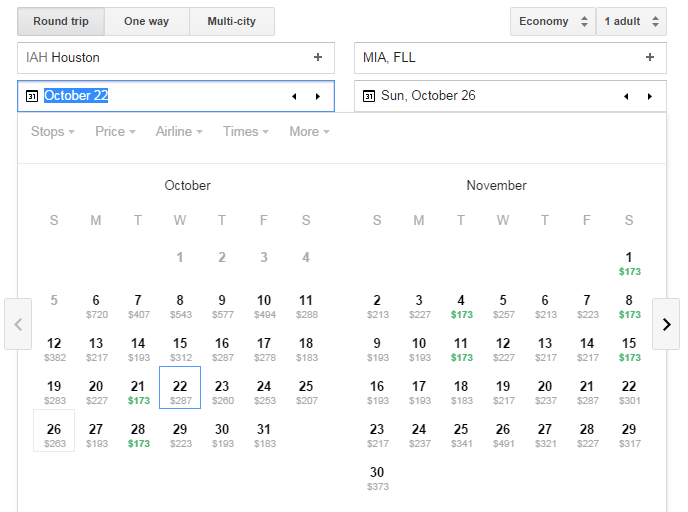 Click on a date to select a return date and see your flight options. In this example, moving our trip forward one day, going to an airport that we didn’t think of initially, and flying a discount carrier saved us more than $200 per ticket. 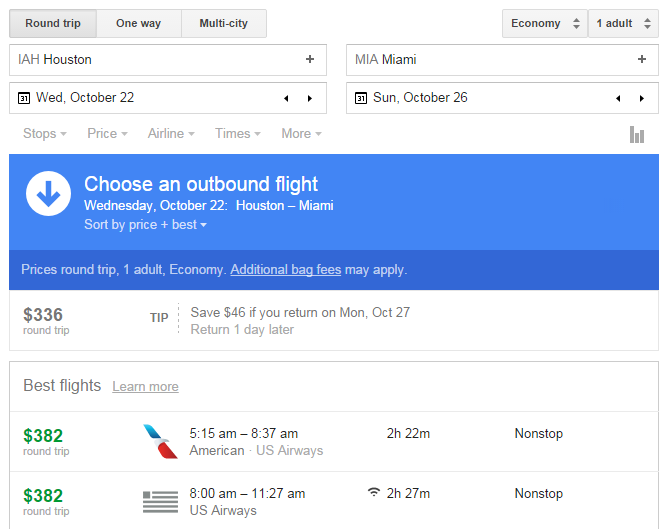 Google Flights does contain a number of other features, but the above should get you started. Readers, what successes have you had with Google Flights? How much money have you saved?